The term hydroponics refers to the practice of growing crops without soil, with the plants receiving their nourishment from water instead. In contrast to soil-based agriculture, where the plants are fed by extracting nutrients from the soil, the roots of hydroponically grown plants are bathed in a complete liquid plant food that contains all the nutrients the plants need. In place of soil, some hydro systems use a medium to anchor the plants, such as rockwool, coconut fibers (known as coir), or perlite. Other systems contain no solid growing medium, with the roots bathing directly in the liquid. The common thread tying all hydro systems together is that the plants are receiving fertility from the nutrient solution, rather than soil. Most hydroponic systems today are housed under cover, principally in greenhouses. Without the absorptive and buffering effects of soil, rainfall tends to dilute the nutrient solution and throw hydro systems out of adjustment. Of the hydro systems that are set up outdoors, most are located in arid parts of the world. Hydroponic systems can be installed almost anywhere, and scaled to a footprint ranging from hundreds of acres down to hundreds of inches, depending on the needs of the grower. In addition, hydroponics can allow a grower to avert soilborne disease and fertility problems through bypassing the soil altogether. They can be situated anywhere, regardless of whether there is good soil or any soil at all — even in a vacant lot or building rooftop. Some hydroponic systems use a medium, such as coco coir, shown here, to anchor the plant roots, while in other systems the roots bathe directly in the liquid. Between commercially manufactured and homemade hydroponic systems, the equipment can be configured in many different ways, but most hydro systems used to grow food crops fall into two main camps: those that do include a solid growing medium (also known as substrate hydro systems) in place of soil, and those that do not (also known as liquid hydro systems). Regardless of the type of hydroponic system, seeds are usually sown in soilless plugs that are designed to hold the growing plant for the entire cropping cycle. The seeds of long-season fruiting crops are usually sown into small plugs that fit into a larger block, usually a 4" (10cm) cube, to allow the seedling to grow larger before being transplanted into the production greenhouse. 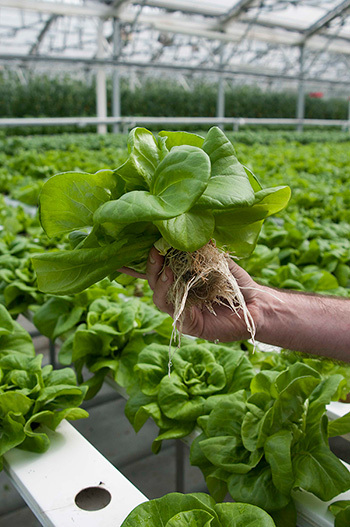 Shorter-cycle crops, such as lettuce and greens, are usually transplanted into the growing system in the original plug without being potted-on to the larger block. The most common materials used for propagation plugs and blocks are coir, rockwool, or inert foam, such as Oasis cubes. 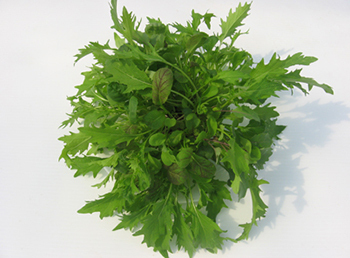 Many lettuce varieties perform admirably in NFT hydroponic systems. 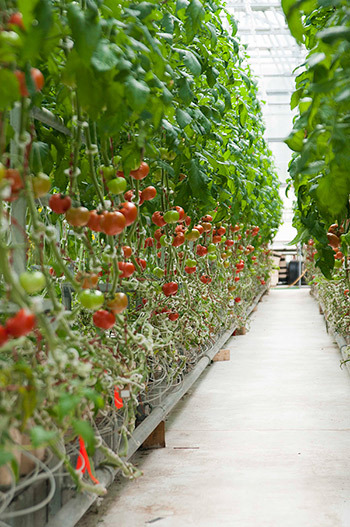 NFT systems use long gutters or troughs to hold the plants as they grow. Typically, there is a top on the gutter, with holes where the plants are placed. The roots grow in the gutters without any medium other than a small plug holding the plant. Nutrient solution is piped in at the top of the gutter, flows down, and drains at the bottom of the channel. The nutrient film refers to the thin layer of nutrient solution present in the channel where the roots grow. 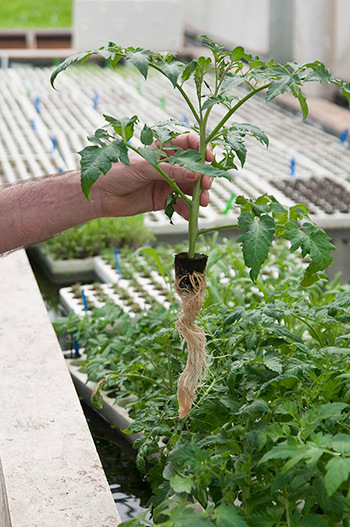 Another common method of hydroponic production that does not involve a solid growing medium, deep-water culture involves growing crops in standing nutrient solution, with the roots dangling in the solution. 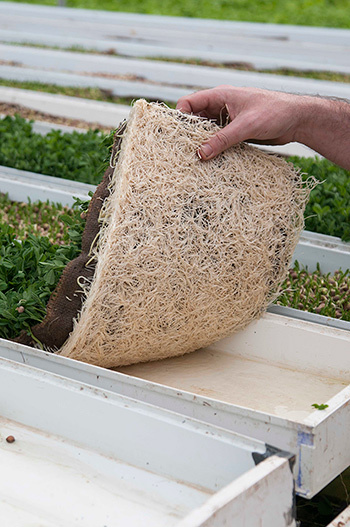 Instead of channels, crops grow in tubs or basins, with the plants commonly anchored in floating rafts, with no medium other than the plugs holding the plants. Aeroponics is a third way crops can be grown without a medium. In aeroponics, the plugs holding the seedlings are suspended in systems where the roots dangle and are sprayed at regular intervals with nutrient solution, instead of being irrigated with liquid. Currently aeroponics is less common than NFT or DWC. Hydro systems using a solid medium can be divided broadly into two main types: container culture and slab culture. The medium holding the plant in hydro systems can be composed of a wide range of inert materials, including rockwool, coir, sand, perlite, sawdust, wood chips, or others. Container culture refers to the use of containers to hold the loose, soilless medium in which the plants grow. The containers can be anything from buckets, pots, or grow-bags specifically manufactured to hold plants, to repurposed bags, buckets, or other alternatives. In slab culture, plants are grown in long, flat slabs of media that are made specifically for this purpose. The most commonly available materials for slabs are rockwool and coco-coir. The size of the slabs varies by crop and conditions, but they are typically a couple of inches deep, a foot or so wide, and a few feet long. Each slab is designed to house multiple plants growing from its top, with the number of plants depending on the type of crop. Slabs are usually wrapped in plastic or biodegradable film, to contain the nutrient solution. Individual slabs are laid end-to-end to form a row. One big difference between liquid and substrate hydroponic systems is that substrate systems usually require one emitter per plant, to deliver the nutrient solution to the roots. This is in contrast to liquid hydroponics, where the nutrient solution is contained in the root zone by the channel or the basin, depending on the system. Aquaponics is a third methodology, somewhat of a hybrid of the other two systems but unique, in that it involves growing crops with recycled nutrient waste from aquaculture. That is, the nutrient solution for the plants is derived directly from water in which fish or other aquatic animals are rasied. The nutrients in the waste from the animals feed the crops, creating an efficient food production system. Aquaponic systems can be integrated with any of the above hydro systems. The aquaculture waste is the source of fertility, and the hydro system of choice, whether NFT, DWC, or otherwise, is the method of delivery. These tomato plugs are ready for potting up. The smaller root volumes and narrower buffering capacity of hydroponically produced crops require attentive monitoring. As with any engineered system, hydroponic growing only works as well as the system is designed and managed. Unlike some field crops that can grow with little attention for extended periods of time, hydroponic systems require management on a daily basis. Instead of building up the soil and inputting fertility at the beginning of the crop cycle, soilless crops are typically fertilized every day, at every watering. With smaller root volumes and less buffering capacity than soil-grown crops, if a pump or timer fails or nutrient solution goes out of balance, the negative consequences for the hydroponically grown crop can occur rapidly and be drastic. Hydro system fertility requirements vary widely on the basis of crop, growing environment, regional, and seasonal factors. Success of the crop is dependent on having a nutrient solution that matches all of these four factors. Beginning hydro growers are encouraged to use a complete fertility program that has been designed by the manufacturer with their circumstances in mind. Once they have an idea of how the crops should perform, more experienced growers can compound their own custom fertilizers from the various required elements. "Traceability in food is very important to consumers now, and aquaponics provides maximum nutrition, no pesticides, and freshness…. "We had our produce randomly tested by the public health authorities, and they came back to us with great results. Clean produce, inside and outside." What are some primary benefits of growing hydroponically? From a grower's standpoint, efficiency, yield, and quality come first to mind — though in the long-term, sustainability could be the primary underlying advantage for all of us. The following are some key elements supporting the case for hydroponic growing. Growing indoors or in a greenhouse can allow growers to better optimize the environment, making year-round growing a more viable option. More growing cycles means more yield. Yield for some crops can also be significantly higher compared to those grown in soil because the roots are well aerated in hydroponic systems; because there are ample nutrients in an readily accessible form (if the hydro grower is optimizing the nutrients in solution); and because plants can be spaced more densely because there is less competition for nutrients. Wherever limitations exist in water use or arable farmland, this aspect of hydroponics increases in relevance. Much of the benefit gained from hydroponics derives from the fact that in most systems, the water-based nutrient solution is reclaimed and recycled. Growers can calculate exactly how much water is needed in their systems, providing growers in areas that lack sufficient water the opportunity to make the best use of water resources. In areas where water use and quality are closely regulated, hydroponic systems allow growers to track volume, precisely measure nutrient flush levels, and meet specific requirements. 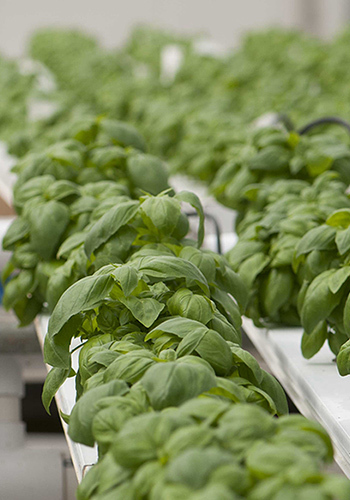 Basil can be produced year-round at any latitude in a hydroponic system. As consumers increasingly seek locally-sourced food, hydroponics can help satisfy this demand. As mentioned, hydroponics systems can be set up even where good farmland does not exist. Urban farms are popping up across the country and in cities around the globe, supplying metropolitan regions with food grown directly within the city. Hydroponic growing also provides educators, chefs, families, and restaurateurs with an opportunity to produce their own crops — on a rooftop, in a parking lot, in a warehouse, or on the back patio — limited only by ingenuity and determination. A well-managed hydroponic operation will be under minimal disease pressure, and most hydroponic growers find they need to use minimal — if any — pesticides. Many growers sell their product as spray-free, which satisfies a significant demand for healthy, pesticide-free food. Given proper management, pesticide use can be reduced and often entirely eliminated. 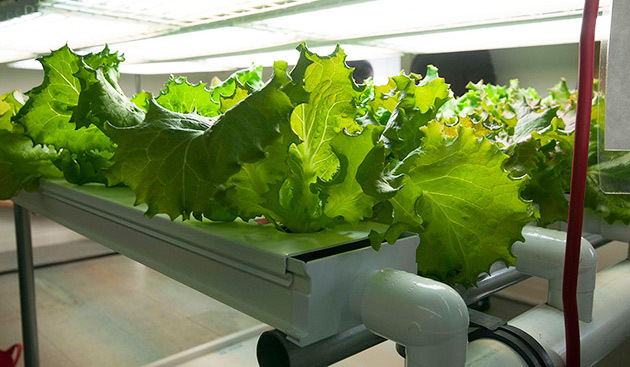 Depending on the type of system used and how well it is designed, hydroponic production can be more ergonomically sound than standard field production. Systems can be built, for example, so that they are waist-high, or arrayed in vertical towers, making for easier care and harvesting. In other systems, entire plots of plants are being shifted to a specific harvest location to make harvest and postharvest handling easier and more efficient for workers. An increasing number of power-reducing technologies can be practicably applied to hydroponic operations: LED lighting for inside and geothermal power for bigger, outdoor facilities, for example. As distinct from traditional soil growing, no tilling, plowing, or weeding is needed in hydroponics systems. Aquaponic systems, in particular, require little to no fertilizer input, as the waste of the live fish grown in tanks can be converted into the nitrogen-rich food the plants need, and the plants in turn can be used to clean the water for recycling back to the fish tanks. And by virtue of their ability to be installed proximal to a market, fewer transportation costs may be involved in producing food in hydroponic systems, thereby helping to reduce its carbon footprint. Whether a grower's everyday values include environmental, fiscal, or social responsibility, hydroponics offers some major practical advantages. Hydroponic butterhead/Boston lettuce can be quickly grown and brought to local markets across the cooler months of the year. In areas with cold winters and moderate summers, fruiting crops are usually started in the winter or early spring and terminated the following fall or winter. In areas with summers that are prohibitively hot for growing, the opposite crop schedule is often used. Seedlings are started in the summer, transplanted into the greenhouse after the hottest weather has passed, and grown through the winter to be terminated the following year before the hottest weather. Lettuce, greens, herbs, microgreens, and shoots can be scheduled for as many short production cycles as the growing season permits. Varieties may need to be modified with the changing seasons to allow year-round production of any given crop. Slegers Living Organic Greens in Strathroy, Ontario, Canada, produces these organic baby greens in a single plug and markets them as a living mix of cresses, mizuna, mustards, tatsoi, arugula, and other greens. Image courtesy Slegers Greenhouses. All rights reserved. The "living harvest" concept is one to which hydroponics is especially well-suited. Since plants can be quickly and efficiently removed from the system with their roots intact, growers are harvesting lettuce, greens, and herbs by pulling them out of the system and selling them without cutting. The main advantage of this method is the prolonged shelf life, as the damp roots continue to feed the plant. Produce sold in this fashion is usually packaged in clamshells or individually bagged, to protect other produce from contact with the roots and nutrient solution. One variation on this technique involves planting multiple seeds into a single plug to deliver multiheaded living produce to the customer. For example, two or more seeds of lettuce, basil, and/or greens of contrasting colors can be planted into the same plug, so the customer receives a multicolored living "bunch." Together with excellent flavor and appearance, crops best suited for hydroponics share certain characteristics. Hydroponic tomato crop in production at Olivia's Garden, New Gloucester, Maine. Olivia's tomatoes are always ripened on the vine. In fruiting crops, a high level of vigor is important to keep the plants strong over a long season. Being resistant to blossom end rot is important in the solanaceous crops, since fast-growing fruits can be susceptible to this disorder. Resistance to diseases common in various growing regions will help keep the plants healthy. Having an open plant habit that promotes air flow can be equally important, as fruiting crops are frequently planted densely in greenhouses. And last but not least, breeding and selection to make sure the varieties thrive in hydroponic conditions are important. The features that make lettuce, greens, and herbs suitable for hydroponics include resistance to diseases common in the greenhouse for leafy crops, such as downy mildew. Tip burn resistance is important as well, as this disorder can be a problem in rapidly growing greens, especially lettuce. Resistance to bolting is also important. When it comes to form, varieties that are dense and compact will allow you to fit more plants into a given space. Lettuce and greens crops that have a head-type growth habit will yield more than open, leafy types in hydro systems. This is a big advantage of Salanova-type lettuces, enabling salad mix production in hydro systems. Before Salanova, it was difficult to achieve good yields of high-quality salad mix hydroponically because it is not possible to densely seed in a line as is typical for field production of salad mix. For greens, yield varies widely by species; varieties must be chosen carefully to ensure the yield is sufficiently high in a plug system to justify the expense. Microgreens and shoots, with their short crop cycles, are well suited to hydroponic culture because they require minimal fertility inputs. They are commonly grown in a modified NFT system, with a piece of burlap or other fabric type material lining the gutter to secure the roots. The microgreens may then be harvested by cutting the stems to provide loose microgreens, or cutting the medium, to provide a square of rooted, living product. 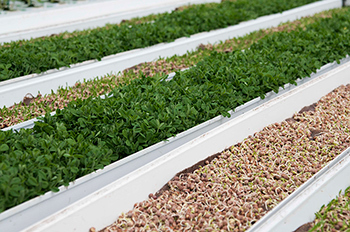 All microgreens are suited to hydroponic production. The most popular food crops for hydroponic production are tomatoes, lettuce, cucumbers, greens, peppers, eggplant, strawberries, herbs, microgreens, and shoots. These crops fall into one of two main production models: one long harvest; or multiple quick harvests. One Long Harvest. Fruiting crops such as tomatoes, cucumbers, peppers, and eggplant are typically raised for a long season of up to a year, and the same plants are harvested many times for an overall high yield. Multiple Quick Harvests. Crops such as lettuce, greens, herbs, and microgreens are significantly quicker-cycle crops, which provide a high overall yield by being planted and harvested many times over the course of a season. Technically, one can grow nearly any crop in any hydro system. However, systems that use media, such as slab or bucket culture, are most popular for the fruiting crops: tomatoes, cucumbers, peppers, and eggplant. Liquid systems are the most popular for leafy crops such as lettuce, greens, and herbs. 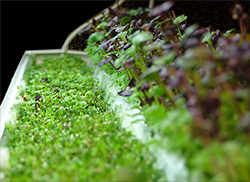 NFT systems are the most popular for microgreens and shoots. Refer to the following tech sheets for additional guidance on materials and methods. This tech sheet describes the basic steps of seed-starting in hydroponic systems and introduces the primary variables that affect plant health and productivity in hydroponic systems. Information presented includes steps for seed-starting in hydroponic systems; primary environmental specifications of hydroponically grown crops and how they are maintained and monitored, including temperature, light, daily light integral, pH, and carbon dioxide; and recommended further reading. This tech sheet describes common hydroponic growing media options and how to select the medium best suited to your needs; how using plugs differs from using a soilless mix in hydroponic production; monitoring salt buildup in different types of media; maintaining medium hygiene; and recommended further reading. As we currently do not have a hydroponic trialing system at our Research Farm, we have aggregated the results of trials of independent hydroponic growers with our own variety knowledge and the information we receive from our suppliers, to compile our Hydroponics Performers category. You can browse and compare all varieties suitable for hydroponic production in this section of our site. This 4-page PDF (2 sheets if printed on both sides) contains most of the information found in this article, in a convenient, printable form. This 2-page PDF (single sheet if printed on both sides) contains a table listing our Hydroponic Performer varieties, in printable form.